Imagine the scene. You have just finished painting and detailing that beautiful unit of infantry. Satisfied with your master peice, you set about preserving your efforts with a carefully applied coat of spray varnish. Most painters, at some point will have experienced the horror of then watching their minis slowly grow a milky sheen and start to go white in all the wrong places. The painting forum "experts" will tell you the temperature was wrong, the humidity was too high, the stars were in the wrong alignment, Blah Blah Blah! In my experience, It can happen in any conditions and is usually just a case of your varnish getting a bit long in the tooth. I have had it happen with both my preferred airbrushed acrylics and with cellulose rattle cans when doing the durable Gloss coat before the final Matt coat. Don't panic, there may be salvation in a diminutive spray can. 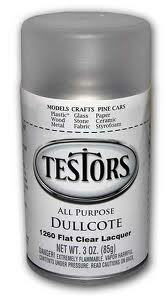 Every self-respecting miniaturist should have a can of Testors Dullcote spray in their armoury. It is my final varnish of choice for a really nice flat finish. I have also found that it has the added bonus of potentially reversing the white frost of death in most cases, even older fully dried examples. Something in the Testors solution breaks down the frost of the previous applications and can completely repair the disaster, or just leave a few white spots to be touched up. Give it a try, it’s better than just crying like a big girl! Salvation in a tiny can. Great finish too!